Horses in the steppe below the Paine Massif, in Torres del Paine National Park. For passionate equestrians, this region's rugged mountains and lush pampas provide an experience that is unrivaled anywhere in the world. This is the story of what happened when two old friends who'd long promised each other an adventure finally saddled up and went on the ride of their lives. My best friend, Bailey, and I were lying in a tent on a windy Patagonia night, cheerfully cataloguing the parts of our bodies that hurt. A few hours earlier we’d been cantering through golden fields on the third day of a five-day horseback trek through Chile’s Torres del Paine (pronounced pie-nay) National Park. The exhilaration hadn’t faded, but my back wasn’t happy. Nor were the parts of my pelvis that had come into relentless, sometimes percussive contact with the saddle. Also sore? My knees, ankles, quads, inner thighs, trapezius muscles, upper abs, right elbow, and, as a kind of garnish, my pinkie toes, whose circulation had been cut off all day by my socks. Bailey dug through a stuff sack for more ibuprofen. “I guess we know why it’s called Torres del Pain,” she said, pronouncing it like what we were feeling. Our group consisted of our guide, Armando, a pair of gauchos who tended the horses, a pub owner from Calgary, Alberta, and the two of us. We’d spent the morning riding from our campsite on an estancia to Grey Glacier, inside the park. The journey, across terrain that abounded with flat expanses ideal for galloping, should have taken 2½ hours. But Calgary, as I’ll call her, wanted to stay at a walk because, she claimed, her horse kept tripping. “You don’t like the horse?” Armando asked. Bailey and I exchanged glances. Never, ever blame the horse. We plodded for more than four hours through cold wind and spitting rain until we reached the shore of the glacial lake, where we had a damp picnic near the Hotel Lago Grey, an airy lodge connected to blocks of rooms by raised walkways. Electric-blue icebergs floated on the milky water. Calgary had signed up for a boat excursion to Grey Glacier, but since high winds had made its departure uncertain, we retreated to the hotel bar to have a cerveza while we waited. Clouds scudded over the lagoon. Then, after an hour: a miracle. The boats were going, which meant Calgary would catch a lift later with the support truck, and Bailey and I could return to camp with Armando and the gauchos at our own speed. We practically skipped back to our horses. Set loose, we breezed across the meadows, passing in and out of sun-showers while black-faced ibis took flight around us. A magnificently craggy clump of ice-topped mountains and cloud-snagging granite spires loomed in the near distance. This was the Paine Massif, the centerpiece of Torres del Paine. Its individual rock features are named after things like horns and cathedrals and fortresses and, most saliently, towers, or torres. Paine is a native word for “blue,” as the massif appeared at a distance to the Tehuelche people. According to Armando, they preferred not to approach too closely, spooked by the frequent thunder of avalanches. Back at camp, Bailey checked our time. Two glorious hours and 15 glorious minutes. We high-fived before dismounting, then staggered, groaning and bowlegged, to the tent. Worth every ibuprofen. Our friendship began with horses. Bailey and I had both been competitive show jumpers in our teens before meeting on our college equestrian team — which sounds fancy but was, in truth, a scrappy club sport practiced on freezing New England Saturdays by hungover riders. Bailey first struck me as a woodsy Vermont goofball, cheerful and game but lacking a certain essential seriousness. Once she was in the saddle, though, her talent, burnished by long experience, was unmistakable. Later I learned she’d ridden with a top trainer and, every year, had attended high school by fax for two months while competing in Florida. I also learned she was brilliant and driven as well as affable, generous, and committed to setting others at ease, even those who, like me, might initially misjudge her. The year after graduation, when we were sharing an apartment in Boston, we agreed that one day we would go on a horse trek together in Patagonia. That was 11 years ago. “It’s all happening!” Bailey called when I spotted her in the Miami airport, black helmet dangling from her backpack. She lives in Nashville, where she runs a microbrewery and shares a Craftsman house with her chef husband and spotted dog. I live in Los Angeles with a spotted dog of my own. Over the years, we’d wistfully reaffirmed our desire to go to Patagonia together, even as the entanglements of adult life made such an adventure seem less and less possible. As we boarded our flight to Chile, it felt like we were renewing our friendship vows. Twenty hours later, after layovers in Santiago and Puerto Montt, we touched down in Punta Arenas, a small city near the tip of South America’s long tail where the Andes, cracked through with fjords, dribble into the sea. Founded by the Chilean government in 1848 as a penal colony, Punta Arenas became an important sheep-ranching center and resupply port for ships passing through the Strait of Magellan. The city’s colonial architecture and stark landscape give it a frontierish vibe, even though the transient whalers and sealers of old have been supplanted by roving bands of adventure-seeking baby boomers in premium outdoor gear. 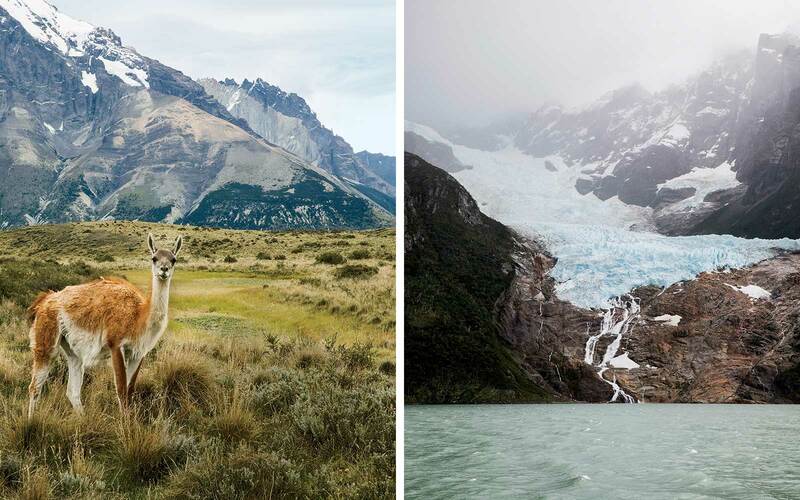 From left: A guanaco on the pampas in Chilean Patagonia; the Balmaceda Glacier, as seen from a catamaran on Last Hope Sound. That evening, we sat on the balcony of La Yegua Loca, a gaucho-themed yet somehow chic boutique hotel, sipping lagers from the local brewery Cerveza Austral. The visibility was unusually good, and from our vantage over the strait, we could see two different faces of the Tierra del Fuego archipelago. The largest island, about 20 miles to the east, was low and shadowy. But far to the south the snowy peaks of the Cordillera Darwin, a remote and forbidding mountain range, breached the horizon, glowing white in a luminous gap between steely sea and gray clouds. Famously treacherous landmarks crowd this corner of the map, with names that inspire an almost painful wanderlust: Tierra del Fuego. Cape Horn. The Drake Passage. The next morning, we would head to another enticingly named place: Seno Última Esperanza, or Last Hope Sound, a winding inlet 150 miles to the north that, in 1557, the Spanish explorer Juan Ladrillero mistook for the long-sought western entrance to the Strait of Magellan. We drove for three hours through grasslands dotted with gnarled, wind-stunted trees and dappled by cloud shadows, stopping once to watch flamingos wade in the shallows of an alkaline lake the color of dirty jade. Mountains with scoop-shaped summits appeared in the distance. At the sound’s southern end, we came to Puerto Natales. As the gateway to Torres del Paine, the town has all the necessary components of an adventure crossroads: gear shops, hostels, a lively brewpub. A few miles from its center was our strange but beguiling hotel, the Singular Patagonia, a collection of waterfront buildings with corrugated roofs that served as a sheep-processing plant from 1915 until the 1970s. It had fallen into dereliction before finding an unlikely dual destiny as a luxury hotel and, thanks to its local significance, a historical monument. We would spend our last night before the trek here, gorging on comfort. The Singular’s preserved industrial spaces serve as passageways between the public areas, where antique machinery is artfully displayed and museum plaques explain how, say, the ammonia pipes worked or what went on in the tannery (nothing nice). The architecture is austere and dramatic, dominated by weathered brick, rough timber, and unpolished concrete. But the hotel’s windows are its most arresting feature. In the spa, the sauna and steam room have glass walls overlooking Last Hope Sound, so you can lie like a sweating slug and watch black-necked swans bob on the choppy water, their long, dark necks curving up from their ruffly white bodies like the legs of upside-down cancan dancers. If you wish, you can swim under the enormous window that separates the indoor and outdoor parts of the heated pool, and, seal-like, poke your head up into the bluster. You can also take in the view from the cavernous restaurant while sipping a pisco sour at the bar or eating local lamb and king crab in the dining room. Even in bed, you’re not deprived of the landscape, since all 57 guest rooms, which occupy what was once the plant’s cold-storage facility, have floor-to-ceiling windows looking out onto the sound. The following afternoon, we swung aboard our stocky little criollo workhorses for the first time. Descended from animals brought over by the conquistadors, criollos are known for their toughness and endurance, the result of centuries of breeding and natural selection on the pampas. 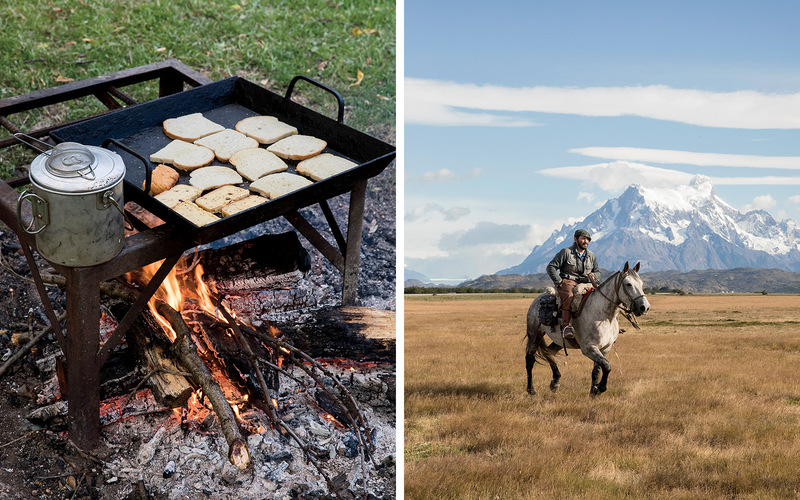 The British company Swoop, which specializes in adventure travel to Patagonia and the polar regions, had set us up with a local outfitter called Horse Riding Patagonia. It is owned by Vicky Mattison, an English transplant who came here 12 years ago, fell in love with a gaucho, and stayed even after the relationship ended. “All I ever wanted in life was a horse and a dog,” she told me. These were priorities I could understand. Set loose, we breezed across the meadows, passing in and out of sun-showers while black-faced ibis took flight around us. Our first ride was a leisurely two-hour amble through an estancia north of Puerto Natales, a shakeout to get Calgary, Bailey, and me used to the Chilean stock saddles, which have a high pommel but no horn, cuplike stirrups, and seats of layered fleece and leather. It turned out I did still know how to ride, though I felt awkward in the legs-forward position dictated by the saddle. We meandered over grassy hills among grazing cattle and calafate shrubs. (An old chestnut holds that if you eat a calafate berry in Patagonia you are destined to return, so we ate a lot, just to be safe.) Armando pointed out two faraway mountains, Cerro Balmaceda to the west and Cerro Paine Grande, part of the massif, to the north. Tomorrow, he said, we would ride the distance between them. They looked alarmingly far apart. Both were clearly being rained on. Tomorrow, Armando said, would be a long day. I nodded, distracted, trying to copy his posture in the saddle. Here’s the thing about gauchos: they look really cool. Armando has a dark beard and long ponytail, and his daily uniform was a quilted denim jacket, bloused brown trousers, calf-high work boots, and a perfectly angled beret. A beret! As if a beret is something you can just wear! In fact, all the gauchos seemed to wear berets. Some also wore colorful woven sashes into which they tucked a long knife in a rawhide sheath, useful for cutting a snagged rein or rope. Often they rode with one hand tucked insouciantly into a hip pocket. Not so long ago, gauchos spent most of their lives in the middle of nowhere, tending their herds, manfully enduring the elements. “The real gauchos are gone, and that’s the truth,” said Armando, who grew up on a sheep farm in the Tierra del Fuego. When not guiding or backcountry skiing, he works cattle near Puerto Natales. “A gaucho used to be totally self-sufficient,” he explained. “From the city he needed only clothing, cigarettes, liquor, maté, and bullets.” (I suspected that Armando, ever courteous, might have delicately omitted female companionship.) Now, he told me, gauchos have smartphones. Some watch television at night. Armando spoke without judgment, but with a trace of loss. A rarely trodden horse trail winds past glacial Lake Pehoé, south of the Paine Massif. That first evening, we camped at an estancia farther up Last Hope Sound. When we arrived, our cook, Levio, had already set up our tents and prepared a shaker of pisco sours that was waiting beside a spread of cocktail munchies. While he cooked a dinner of salmon with onions and peppers over an open fire, we snacked on cheese and olives and got a little tipsy. It was all very civilized. After dinner, as the fire burned down, Armando reminded us that our ride tomorrow would be quite difficult — eight hours over challenging terrain — and gently encouraged us to adjourn to our tents. I slept poorly, kept awake by the wind rattling the tent, nerves about the coming ride, and one aluminum tumbler too many of pisco sours. In the morning, we took a catamaran up Last Hope Sound to the Serrano Glacier, where poor Juan Ladrillero’s dreams of finding the western entrance to the Strait of Magellan met an icy dead end. The blasting wind pulled sheets of mist up from the water. Andean condors circled above the cliffs. Once we reached the glacier, a smaller boat buzzed us across an inlet to a nearby estancia, where our horses were waiting. Mine was shaggy-maned and black and an absolute champ. He plunged without hesitation into deep mud that made me think of the horse-swallowing swamp in The Neverending Story, forded gamely across a cold green river, picked through complex lattices of roots and logs in the dense beech forest, clambered like a goat over ledges, and slid down rocks so sheer I caught the acrid smell of his shoes as they scraped against the granite. I left the reins loose, trusting him to choose the best path. After four hours, we emerged from the forest onto the black-sand beach of brackish Lago Brush. The Paine Massif heaved into view, crowned with fat white cumulus clouds. As a landform, the massif is so spectacular it becomes exhausting. You find yourself dreading the moment when it is no longer in sight. You’re compelled, as if by a curse, to take photo after photo, though none will capture its grandeur. For the rest of the day, four more hours, the jagged peaks bobbed in and out of sight as we crested and descended until, finally, in the golden hour before twilight, we found ourselves overlooking a perfect valley of thick trees and luminous yellow grass, with a turquoise river snaking through. The Paine Massif stood on the far side like the end point of a mythical quest, as forbidding as it was alluring. It was 8:30 by the time we trotted into camp, but daylight still lingered. Levio had pitched our cheerful orange tents among the trees and was waiting with happy-hour treats. I was impressed again by the seamlessness with which he and the Horse Riding Patagonia crew handled the daunting logistics of the trip. Every day we got hot dinners, plus the sandwich lunches we carried in cute little tins in our saddlebags, supplemented by surprise extras that Armando produced like a magician: a thermos of hot soup or coffee, a flask of Baileys Irish Cream, a chocolate bar. A rotating cast of gauchos and horses appeared and disappeared, passing us off like human relay batons, shepherding us through a wilderness we truly seemed to have to ourselves. 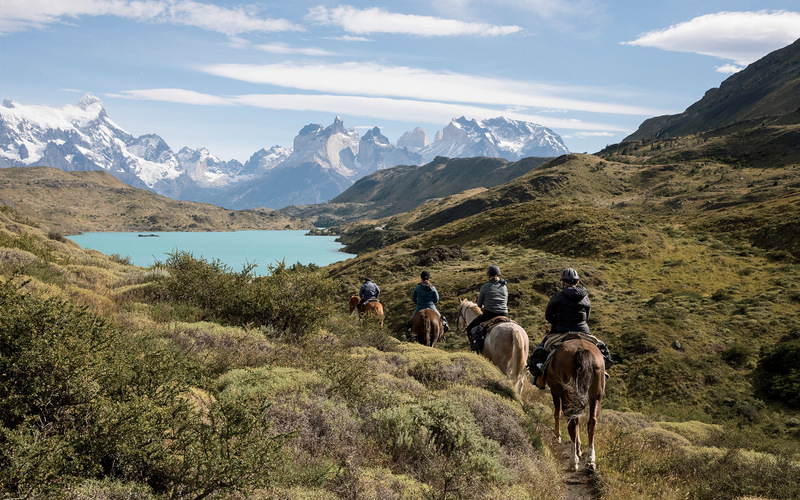 And that, besides the fun of hanging out with animals, was the best thing about seeing Torres del Paine on horseback: we never encountered any other riders along the trail. Not one. The morning after our out-and-back to Grey Glacier, Bailey and I woke up with joints so stiff we were creaking around camp like knights in armor. As we mounted fresh horses, we felt aghast at the prospect of riding another 30 miles, but we loosened up after a gallop in the morning sun. Guanacos, a species related to the llama, grazed above us on rocky hillsides. Throughout the day, we drew ever nearer to the Paine Massif until, late in the afternoon, we rode past the park’s three namesake torres and finally turned our backs to the mountain range. After a few more miles, we said goodbye to the horses and climbed into a waiting van. From the rear window, with mingled sadness and relief, I watched the massif recede and disappear. From left: Breakfast at a campsite in Estancia Perales, near the Río Serrano; Armando, the author's guide, shows off his gaucho flair. Our last ride was an easy loop on another estancia, Pingo Salvaje, where we slept in a cabin (with beds!) instead of tents. When we woke, the skies looked ominous. Bailey and I grumbled about going for a rainy ride without a destination. We didn’t think it would give us the same sense of toughness and accomplishment we took from our long, taxing journeys. At the same time, we didn’t want to leave the trek unfinished. After breakfast, we rode out with Armando and Javiera, a vivacious young female gaucho who rode in sneakers and no beret and said she planned to become a large-animal vet. The gloom lifted. Under blue skies, we skirted a reedy lake shore, cantered along sandstone cliffs, and stopped to investigate a cave that had once held the skeleton of a saber-toothed tiger. The whole trek had been perfect, we agreed, because it couldn’t be perfect. We were unspeakably sore and craved ibuprofen, pisco sours, and the pool at the Singular, where we would spend our last afternoon in Patagonia. Yet we also wished we could just keep riding, crossing more mountains and valleys, on into forever. Turning toward home, Javiera led us through a field of dandelions as riotously yellow as a van Gogh painting. Heaven on horseback. Fly to Punta Arenas via Santiago. From there, rent a car or ride the bus about three hours north to Puerto Natales. Horse Riding Patagonia: Choose between five- and 10-day trips in and around Torres del Paine, with options to sleep at campsites, estancias, and hotels. five-day trips from $2,499. Swoop Travel: Specialists can craft your dream trip from prepackaged or custom tours in Patagonia. Activities include kayaking, skiing, and more. five-day trips from $1,096. Hotel Lago Grey: Located in Torres del Paine National Park, this property’s restaurant and rooms offer majestic vistas of the lake and glacier. doubles from $188. La Yegua Loca: The décor at this hotel balances the modern and rustic. The rooms’ crisp, white furnishings are offset by cozy sheepskins. doubles from $125. Singular Patagonia: Stunning scenery and a sense of history lend character to this property, marked by its architecture and excellent service. doubles from $425.